Best Cigar I've tried so far. Looks life the one I'll order most. 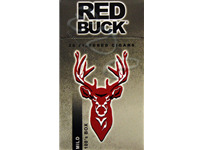 We have been using redbuck filter cigars for several months now,I bought a pack of cigarettes to tide us over until new ones arrived,they were aweful!! No flavor and burn up so quick you felt like you had to smoke 3 to get the same satisfaction you get from 1 redbuck, luckily they came that day and we were saved from smoking any more regular cigarettes. The shipping is fast and the value and quality can't be beat. We are customers for life.